Located in Papamoa East a short drive to the Fashion Island, the Warehouse, etc and only 15mins from the Bayfair Mall and many other attractions in Tauranga. Only a 3 minute walk to the beautiful Papamoa Beach. 3 minute walk to the local shops and takeaway and restaurant. If you are looking for a laid back time away where you don't have to watch the kids every move then this would be great. The bach has been freshly painted and has new wooden floors throughout. New bunks in 2nd bedroom with a double on the bottom and single on top. Its basic but clean with a "large" front deck to relax in the sun or for the kids to get some air and play with the toys. Deck is fully fenced with lockable gate. Outdoor furntiure for you to enjoy the sun with - large wooden table and large free standing umbrella bolted to the deck. Good quality beds will ensure that you don't leave with a sore back! There is also a SKY digital connection so simply bring your decoder and plug it in - no need to miss those important sporting events - TV and a good quality stereo( please consider our neighbours). NB: Please note we only let to family groups - NO YOUNG PEOPLE GROUPS THANKS - PLEASE DO NOT APPLY!! Minium 2 night stay. Pricing based on 2 adults plus children. We had a great time catching up with old friends and the Bach served our purposes perfectly. Nice and clean and had everything we needed. The location in relation to beach, shops, etc was great. Unfortunately it is located on a very busy main road and being an older house the soundproofing is non-existing. The large deck was well used :) It is as stated....an old small bach. so don't expect much. However it was perfect for my budget and needs. Well furnished, nice deck outside. Well furnished, nice deck outside. Great location. Teenage kids enjoyed it too. Will return. Highly recommended! 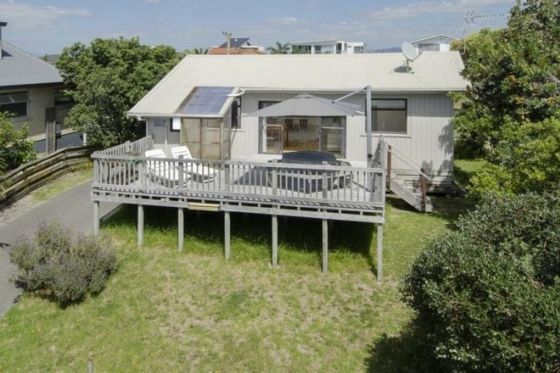 Great location, close to beach. Great location, close to beach. Dairy and takeaways close and large shopping centre a short drive away. Nice deck and bbq table and Fridge freezer a decent size. It is a basic bach but that's exactly what we wanted and this was reflected in the competitive price.